What does the CWA require of the States? 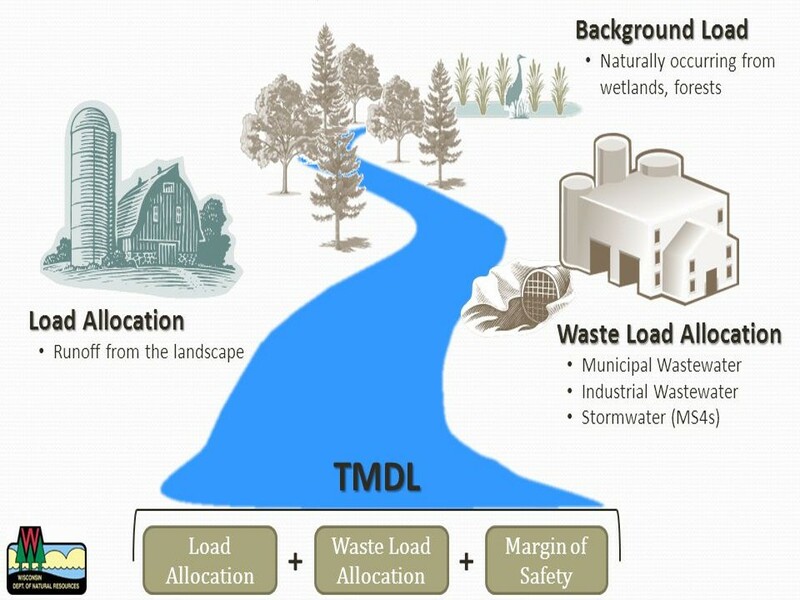 A TMDL establishes the maximum amount of an impairing substance or stressor that a waterbody can assimilate and still meet Water Quality Standards (WQS) and it allocates that load among pollution contributors. TMDLs are a tool for implementing State WQSs. They are based on the relationship between pollution sources and in-stream water quality conditions. A TMDL addresses a single pollutant or stressor for each waterbody. A TMDL is the sum of the allowed pollutant loads for point sources, non-point sources, projected growth, and a margin of safety. Point sources are discharged from a specific, identifiable source. Nonpoint sources are nutrients and pollution sources not discharged from a single point: e.g. runoff from agricultural fields or feedlots. Load allocations are determined through the review of monitoring data and watershed modeling. The tools used depend upon the complexity of the problem. What role does the public play in the TMDL Process? Once work on a specific TMDL begins, local governments, identified interested parties, and appropriate dischargers in that watershed will be consulted during key stages of development. Introductory TMDL briefings may be provided upon request. A second round of more in-depth briefings will be provided to those who request more detail. The public is invited to become involved in the listing process. After a draft TMDL has been developed, a formal public notice and comment period will be provided prior to the TMDL’s submission to EPA. When a TMDL is approved, stakeholders will participate in determining how the TMDL should be implemented to reach allowable loading levels. Why is Lake Pepin placed on the 2004 Impaired Waters List? Lake Pepin has been placed on the 2004 Impaired Waters List for two types of water quality problems. As a lake, it is impaired by excess nutrients (euthropication) that cause algae blooms, particularly severe during lower-flow periods. Eutrophication is the aging process by which lakes are fertilized with nutrients. Natural eutrophication will very gradually change the character of a lake. Cultural eutrophication is the accelerated aging of a lake as a result of human activities. As part of the Mississippi River reach extending from the St. Croix River to the Chippewa River, Lake Pepin is also turbidity impaired. Turbidity measures particles in the water, such as sediment and algae, related to the depth sunlight can penetrate into the water. Higher turbidities reduce the penetration of sunlight in the water and can affect species of aquatic life that survive in the waterbody. A Total Maximum Daily Load (TMDL) defines the maximum amount of a pollutant that a waterbody can carry without violating water quality standards. What is the current status of Lake Pepin? Lake Pepin is at the downstream endpoint of the most polluted reach of the Mississippi River in the state. It is no accident that this reach begins at the confluence with the Minnesota River. The Minnesota supplies most of the sediment that makes the Mississippi constantly muddied, and threatens to fill Upper Lake Pepin with mud before the present century is past. Suspended solids from the Minnesota River make the Mississippi incapable of supporting the rich rooted vegetation that once made the river and Lake Pepin a haven for ducks and swans. Nuisance algae blooms during hot, dry summers are another threat to water quality in Lake Pepin. Metropolitan wastewater treatment facilities have drastically reduced their phosphorus discharges, the result of a successful campaign to protect Lake Pepin following disastrous algae blooms in 1988. However, demographers expect an additional million people to settle in the Twin Cities over the next couple of decades, a trend which threatens to reverse recent progress in wastewater quality. Moreover, continuing high phosphorus loads from the Minnesota River pose an ongoing threat to Lake Pepin. Phosphorus concentrations are so high in the Mississippi, at 150 to 200 parts per billion, that a warm, calm dry spell in any summer could quickly trigger unsightly algae bloom. The Minnesota Pollution Control Agency will soon complete a Total Maximum Daily Load (TMDL) study that will prescribe reduced loads of sediment and phosphorus from upstream sources, particularly the Minnesota River and Metropolitan Area wastewater treatment facilities. While the MPCA has regulatory authority over wastewater discharge, agriculture – the source of much phosphorus and sediment in the Minnesota River – is largely unregulated. How does Lake Pepin sedimentation relate to the South Metro Mississippi River TMDL? The South Metro Mississippi River is unique in that it bears an enormous burden of sediment from the Minnesota River — 10 times the load that was discharged in pre-settlement times and 7 times as much phosphorus. Upstream of the confluence with the Minnesota River, the Mississippi River meets the standard for clarity — the statewide turbidity standard — with ease. Also, downstream of Lake Pepin, where most of the sediment particles settle out, the Mississippi River meets the state standard and supports a healthy aquatic ecosystem. Between the Minnesota River and Upper Lake Pepin, the river’s aquatic ecosystem is severely constrained by turbidity. Extensive research has shown that the statewide turbidity standard is not adequate to support a healthy ecosystem. Hence the need for a site-specific standard. The draft standard that has been developed would reduce suspended solids in the water by about half, and double the density of beneficial rooted vegetation. Technically, the standard calls for 32 parts per million of Total Suspended Solids at Locks and Dams 2 and 3 as a summer average. The U.S. Geological Survey’s Long-Term Resource Monitoring Program’s bimonthly water quality monitoring data will be used to measure this water quality statistic. Why does Lake Pepin need a site-specific standard for phosphorus? Lake Pepin is very different from most of the lakes for which water quality standards were developed — glacially sculpted lakes with small watersheds and a very slow rate of water exchange, allowing months or years for the processing of nutrients by aquatic organisms. Lake Pepin was created by an alluvial dam of sand at the mouth of the Chippewa River some 11,000 years ago. It has an enormous watershed, covering half the state of Minnesota, and a very short flushing rate — ranging from 6 to 60 days, depending on whether the river is flowing high and fast or slow and low. A site-specific standard is needed to define the concentration of phosphorus, the limiting nutrient for algae growth, for the range of flows at which the potential for severe algal blooms arises. This standard has been challenging to develop because of the mixed river/lake nature of Lake Pepin, and because the usual signal of nuisance algal blooms — chlorophyll a — is affected by the presence of tiny organisms called diatoms, as well as non-nuisance species such as green algae. By contrast, most lakes are dominated by nuisance blue-green algae in mid- to late summer, and chlorophyll a is a reliable indicator of nuisance algae. Citizen surveys have determined that for Lake Pepin nuisance conditions are present when chlorophyll a levels reach 50 parts per billion (compared to 30 parts per billion for normal lakes in the same type of region). MPCA scientists have determined that a summer average of 32 parts per billion chlorophyll a — just a bit above the standard for normal lakes — will minimize the number of days when nuisance conditions are experienced. A phosphorus concentration of 100 parts per billion, far below the current average of 180 pbb, will be needed to achieve this standard, according to a computer model constructed to characterize the Mississippi River from Lock and Dam 1 to the discharge point of Lake Pepin.